Actually, most of the components are in already. A small shipment from Mouser will arrive soon and I still have enough conductors to build 20 shields. More are on order and will here within 2-3 weeks. As with the ones needed for the prototypes I have not been able to find these at any source her in the US so I sourced them again from the UK through Allied Electronics / RS components. I’ve also decided to invest in a laser-cut stainless steel stencil from Stencils Unlimited. The mylar stencil from Pololu.com was fine for the prototypes and likely would have lasted a good number of boards longer but the print quality of a stainless steel stencil is simply better and more consistent. Also of course a SS stencil is much more durable. 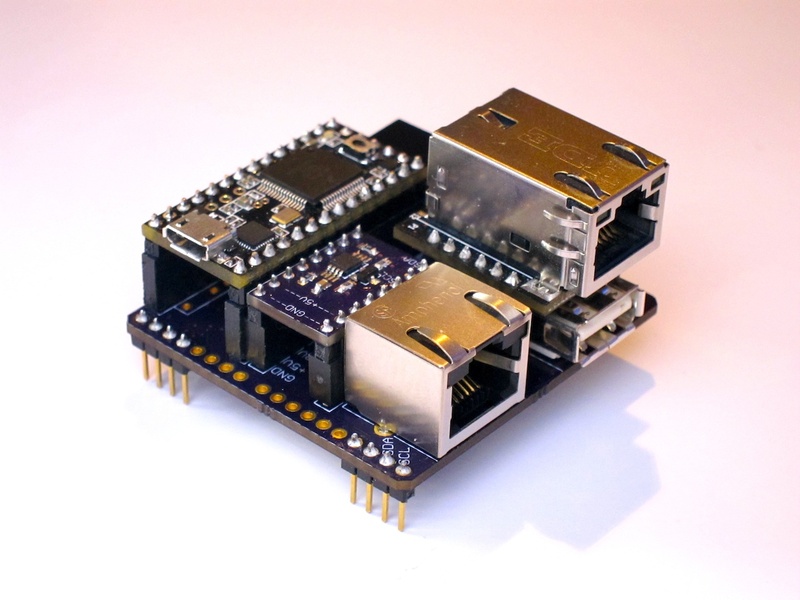 It features an I2C bus extender based on the PCA9600 chip from NXP. I’ve successfully used a shield on 5 meters of CAT5 Ethernet cable and on my oscilloscope signals looked crisp even at 1.5MHz, so there is quite a bit of headroom to use even longer cables and more devices such as the shield. Also, what can’t be seen on the Photo is a IR receiver and the Teensy3 happily receives and decodes IR signals from my Apple Aluminum remotes. A nice feature of the Apple remotes is that they can be paired to a device. I have not quite yet finished the code but I have determined the codes that the remote uses to be paired. However, before I do that I need to make a second prototype, which features an SD card slot for permanent data storage. It would not make much sense to having to re-pair a remote every time the micro controller has been powered down. In order to function together with the I2C bus extender I also re-designed the little Arduino I2C extender board. It has SMD pads for different pull-up resistors and also needs a small Schottky diode when operated in conjunction with the PCA9600 I2C bus extender. 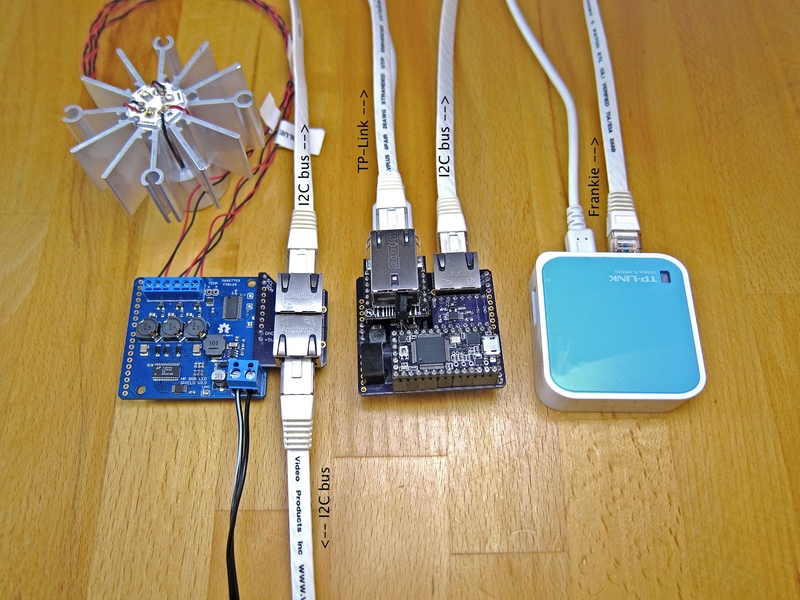 Below is a picture of a “complete” system, including a micro controller, WiFi Ethernet Hub for remote control ability through OSC / TouchOSC and a LED shield with the I2C extension board. More shields can simply be daisy chained onto each other using inexpensive pre-configured CAT5 Ethernet cable. Another interesting idea I had is that it could be quite useful to expose all the functions of the LED shield through the OSC protocol. That way you could create LED effects code directly from a computer e.g. with MaxMSP or Pure Data without having to program the micro controller. That is a question I’ve been contemplating about for the last few days. Having produced a first functioning prototype is quite encouraging! The question is now what to do with that success. While there have been some people that have shown interest in buying one, currently the number possible orders does not exceed 20. That on the other hand would not justify having 50+ boards manufactured as that would include having to lay out about $2000 in advance. We have been in contact with a manufacturer in Germany (where the co-host of this blog is located) , specialized in manufacturing small series. This by the way is not a garage shop but a company that has been doing this for 20+ years and they’d be providing us with a complete turnkey solution. We send them the layout and money and they send us back completed boards. However, that only makes sense if the number of boards is larger than 50 for the first batch and would also really only make sense if there would be several batches of 50+ boards after that. We could investigate to find a less costly alternative, however, the reduction in cost would have to be rather significant 30%-50% to really make a difference. We have a costed BOM and the price of all the components assuming Newark as the source of supply is about $27 for a qty of 50 boards. That does not leave much room for the labor to actually build the board. My current thinking is to set up a fund raiser at Tindie and then post on a few forums to determine if there is enough interest to justify having 50+ boards manufactured. Another option would be InMojo. 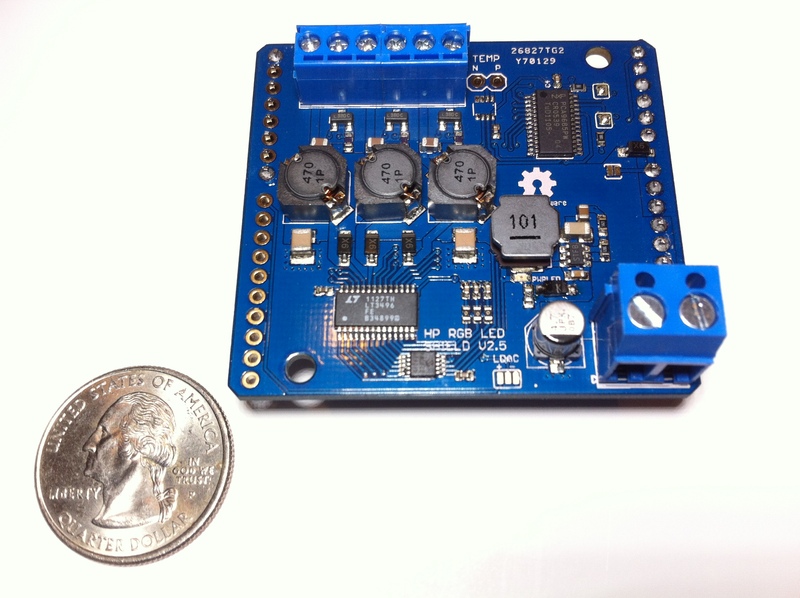 They are also offering assembly and serve as a sales platform for open source hardware. Meanwhile, as I’ve mentioned above, my early success is really encouraging. Should there not be enough interest I can imagine making these myself depending on what QTY is involved. 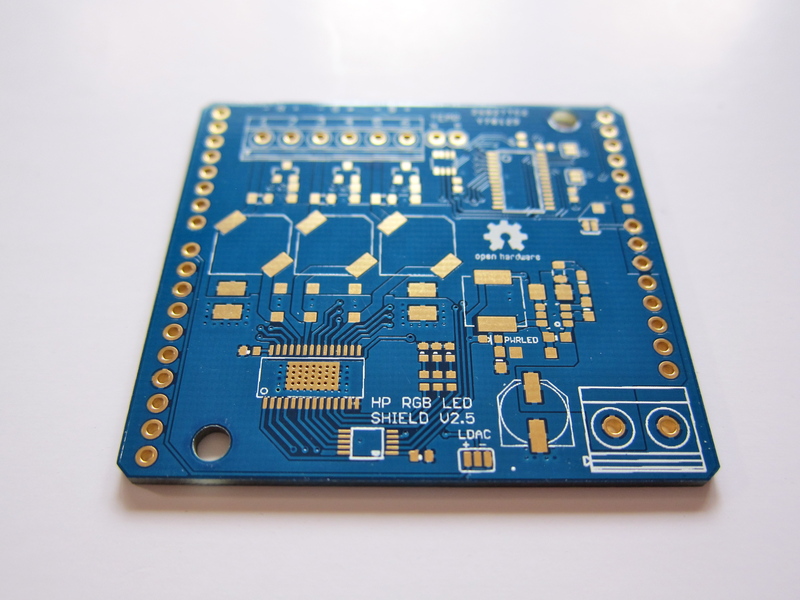 Making the first prototype was my first venture into SMD and Solder Paste and Reflow Soldering in a Toaster Oven. I started around 6:00PM in the evening getting all the materials ready, building a makeshift stenciling fixture etc. I was done with testing the prototype and had written the blog post by 11:00 PM. I believe it took me a good 120 minutes to populate the board. I had not made an assembly plan and I was doing it on my computer desk going back and forth between the layout and schematic in Eagle to see where the component went and and then I had to use the BOM with the Newark part number and find the bag/reel/tape with the component, and get them out of the packaging to be finally be able to place the thing on the board. With some better preparation and a little hardware I believe I should be able to get it to well under 30 minutes per board. I have ordered several of these and several of these and with some intelligent, labeling and an assembly plan things should progress much faster. I have sets for 4 more prototype boards and will see how quickly these can be assembled with better planning within the next week or so. After finally being able to source the Inductors from RS components in the UK I had thought that I was ready to go, as I had already placed an order for the solder paste. But I received a call from the rep and the particular brand and type I had selected was not available or recommended so I had to wait another 10 days until a better alternative was back in stock. So after having to wait another two weeks, yesterday evening UPS made the final delivery. It is usually not a good idea to start new endeavors such as populating an SMD board with almost 50 components for the first time and reflow soldering in a hacked toaster oven for the first time at 6:00PM in the evening, after a full day of work with another one coming up the next day, but I had been almost giddy with anticipation and just could not help myself! I re-stenciled the solder paste twice as I was not happy with my first two attempts. However, it turned out to be easier than I had thought. Then I started placing the first components on the board. Reflowed on the board the smallest resistors and capacitors look at least 50% bigger than they actually are. And while placing these was not easy and somewhat time consuming, the surface tension of the melted solder pulled these into the correct position. One of the big ICs fell onto its spot less than ideally positioned and the nicely stenciled solder paste spots were very smudged after repositioning the component. This did not look so good! But I was to curious about the reflow solder process, so I continued to populate the board. When I finally was ready to place the thing in the modified toaster oven I fully expected it not to work. The reflow process is actually quite fast – somewhere around 4-6 minutes – for lead free ROHS compliant solder and I watched the process with eagle eyes. I did not get the cheapest available equipment but bought things that required little hacking and had proven to be successful. After all, I was not looking for yet another side project but an inexpensive but functioning solution. So I bought the reflow Oven Controller Shield and a Panasonic IR toaster oven that someone on the RocketScream forum had reported successful results with. I also made sure I bought the recommended K-Type thermocouple. I followed the set-up instructions for the Arduino Reflow Oven Controller Shield and attached to and placed the tip of the thermocouple on a PC board that I placed in the reflow oven with the board to be reflowed. I paid attention to the Reflow profile of the solder paste I chose (Amtech NC-560-LF). The the heating part of the profile did not need much attention. If the oven has enough wattage it will heat up quickly enough and the PID control characteristics of the reflow Shield followed it precisely. I had copied and pasted the serial output into a spreadsheed and saw that the cooling, however, was much slower than recommended. Anyone who has ever had material sciences in school/college knows that the cooling of molten metal is as important to the proper crystallization of the solder joint as the heating is for activating the flux (etc.) so I made sure that I opened the oven door to get to the correct cool down speed -2-4 degrees celsius. But of course just because the board was nicely soldered still does not mean that it’ll work. And it did not in the first attempt as the power LED remained unlit. When placing the components I had switched the polarity of the one diode in the switched on-board power supply but this was an easy to detect mistake and because the diode was one of the bigger components it was easy to fix with a soldering iron. When you start building objects like these lighting systems there are things that you don’t make yourself but which you buy, like aluminum tubing or the microprocessor board that runs the show. I also bought the LED driver boards that allow for the smooth blending of colors. These were designed by another hobbyist and he had a blog set up through which these could be purchased. Last year when I was ready to build a second model I had hoped to contact him again for another set of these wonderful devices, but I discovered much to my dismay that he had apparently abandoned his blog as he had not responded to any questions or inquiries on his blog. Fortunately he published the designs of his high brightness LED driver board as open source/open hardware and for the last several months I’ve been working on redesigning the board. While the final PCBs are not likely to come from ITEAD studio in China, this it what is show in the image below. Pretty nice for the price if you ask me! 10 boards for little more $50. The photo makes these look huge but in reality they are about 2″ x 2″. I am still waiting for the Inductors to come in from the UK (were not available in the US) and I should have assembled and functional prototypes within the next 3-4 weeks. My PID controlled Toaster oven is already set up and tuned to follow a temperature profile and I am feverishly waiting for the last components and the solder paste (lead free) to arrive.